Hazel make excellent beanpoles and pea sticks. The straight and slightly rough surface of the hazel rods are perfect for creating a structure for beans to grow up. Every gardener has their own preference but a good beanpole would normally be approximately 8ft (2.4m) tall, 11/2inches ( 3- 4cm) at the base, straight and tapering to the tip. Often beanpoles will curve slightly towards the top which can be useful for creating arches or beanpole racks. Beanpoles may be sold in bundles of 11 to allow for an even number of uprights and a ridge pole along the top. The top branches of hazel rods when grown in a well managed coppice will naturally grow in a fan shape. These branches make very good pea sticks. They are easy to transport and create a lattice or tunnel for peas to grow up. Normally sold in bundles of 10. 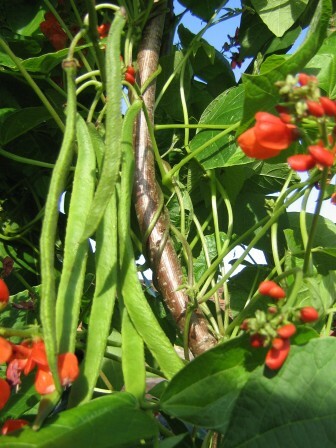 Every year the humble beanpole is celebrated during National Beanpole week.